Any regular reader of this blog will know that brunch is my favourite meal of the week. I like to drink too much coffee (it’s the weekend!) and either go out, or whip up something that I wouldn’t have time to eat or make during the week. You see, on the weekend, you have the luxury of time. There are no deadlines to get lunches packed and out the door. During the week, our standard breakfast, like many of you, I’m sure, is cereal, yogurt, fruit, a smoothie, bagels or homemade toaster waffles. But on the weekend, we have time to drink some coffee, chill out, and make something that demands more time and attention, and is correspondingly delicious. The sprout and I recently got to check out a new brunch location in the city. Campagnolo is known for a couple of things: a fascination with everything pork, and really outstanding pizza. Among the best in the city, in fact. They opened up Campignolo Upstairs as a cocktail bar a few months back, but this past weekend, they unveiled their new brunch. One of the things we tried inspired this dish. 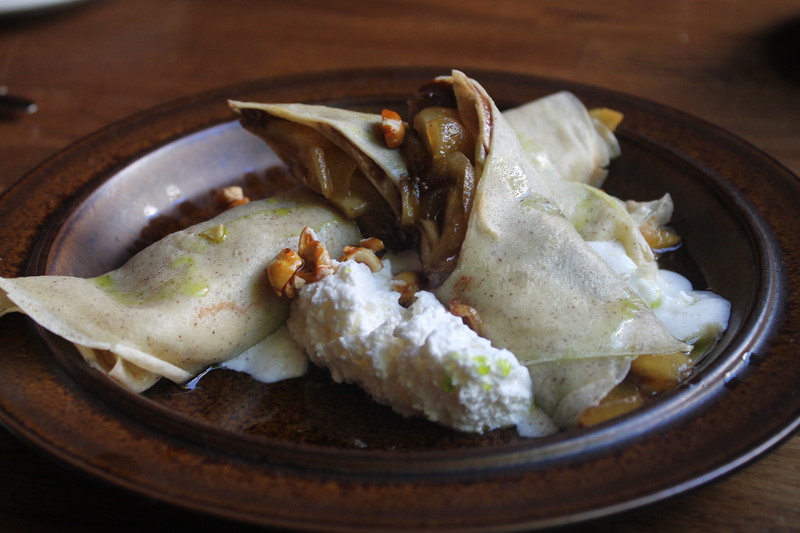 It was a hazelnut crepe, filled with pink lady apples, hazelnuts, and a honey chantilly. Nutella is a staple in our house, and Michael will eat it for breakfast, lunch and dinner if possible. 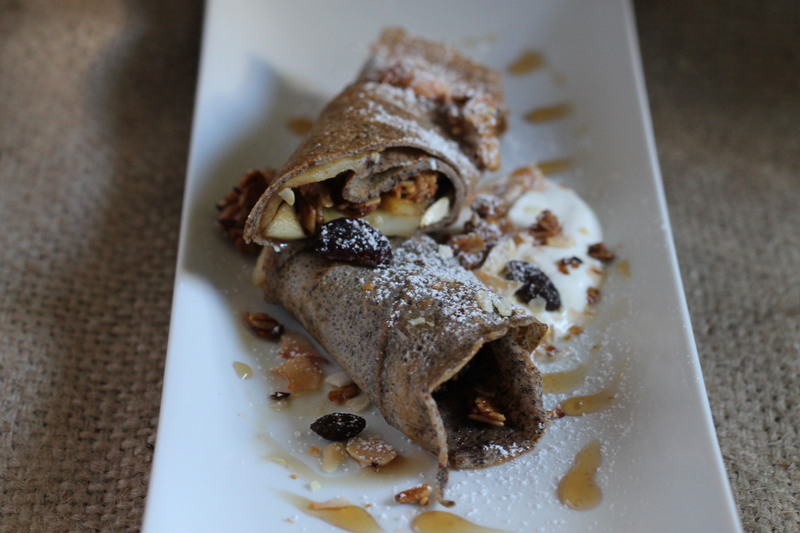 I also wanted to incorporate some beautiful granola that I’d gotten from Terra Breads. They have just launched a new flavour, with includes dried apricots and pistachios. Mmm… The granola adds a lovely textural element, and a nice crunch to the plate. This was one of those situations where literally every component that went into the dish was homemade. You don’t have to do that… I don’t always, it just worked out that way this time around. Yogourt: 1 cup store bought Greek Vanilla Yogurt, or you can make your own, and add 1/2 tsp of vanilla beans and 1 tbsp maple syrup or honey to sweeten. 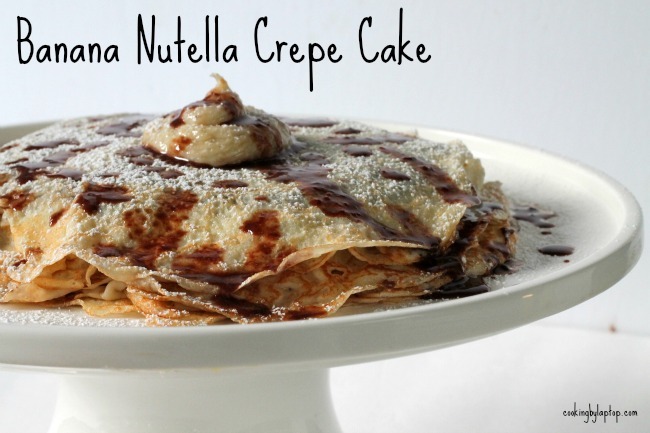 Prepare the crepe batter, and set it aside. Crepe batter works better when it’s sat for a while. Peel and core the apples, and slice them thinly. Over medium-low heat, melt the butter in a small frying pan, and add the apples. Season with a pinch of salt. Allow the apples to saute for 3-5 minutes. They will start to get juicy and little caramelized. You don’t want to cook them down to mush, but you want them to be softened. Add the brown sugar, and stir well. The brown sugar, butter and apple juices will make a beautiful caramel-like sauce. Once the sauce has thickened, and coats the apples nicely, remove from the heat. 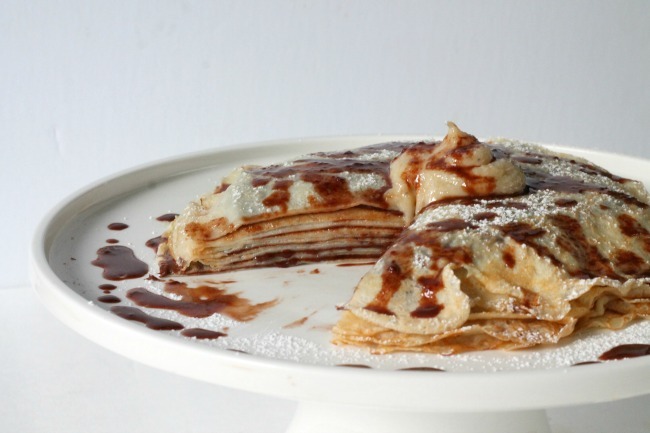 To assemble: place a crepe on a flat surface or a plate. Spread thinly with a schmear of Nutella, and then spoon some apples on top. Roll up the crepe like a cigar. Place on a plate, and garnish with a dollop of the vanilla greek yogurt, sprinkle around some granola, and drizzle with a little maple syrup. Dust with powdered sugar and serve.